Children's Rabbit & Guinea Pig Books can be found in the Childrens' Small Mammal Books Section. Happy, Healthy Pet guides focus on different kinds of pets, the emphasis remains on making the pet a companion. In addition, owners of more unusual pets will particularly appreciate the expert advice in these books because professional care for their animals may be difficult to come by. As always, the instruction is from experts. Chapters: History of the rabbit, as pets, breeds, indoor rabbits, outddor rabbits, nutrition, grooming, health, understanding your rabbit, fun with your bunny, & recommended reading & resources. Color photos. 126 pgs. David Taylor a veterinary surgeon, tells you what you need to know about buying, keeping & breeding rabbits. 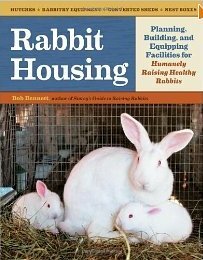 He covers: behavior, biology, how to find the right rabbit, housing indoors & out, handling, feeding, mating, pregnancy, birth, and signs of illness. Also covered are the origins of the rabbit and info on various breeds. Color photos. 128 pgs. Easy-to-read text provide expert practical advice fro both beginners and those more advanced. Highly infromative and beautifully illustrated, the book offers readers special advantages not found in any other book about the same subject. This book contains 3 large full-color posters plus 16 pages of exciting full-color photos. 78 pgs. Origins, temperament, life cycles, purchasing, cages, bedding, nests, housebreaking, diet, health, breeding, body language. Color photos. 64 pgs. Covers: Temperament, life cycles, purchasing, cages, bedding, nests, housebreaking, diet, health, breeding, body language. Color photos. 69 pgs. Selecting, rabbit health, breeding, behavior, species, suitability, w/children. 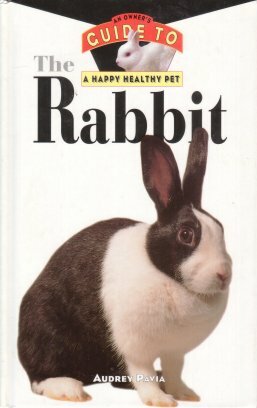 Devoted entirely to the pet rabbit, this book is a practical and concise veterinary guide to health, husbandry & diseases. Nutritional requirment, clinical examinations, the body system approach to describing diseases, their diagnosis & treatment, and seperate chapters on behavior, anaesthesia, surgery & zoonoses. 178 pgs. As pets, breeds, selection, housing, ailments, nutrition, breeding. Housing, feeding, general management, breeding, diseases & treatment, exhibition. B/W & Color photos. 90 pgs. Breeds, breeding, health, nutrition, housing, slaughtering & processing, skins. This book is designed specifically for use and enjoyment by beginners. Chapters cover: Natural history, accomodations, stock selection, feeding, breeding, rabbit breeds, health, and show rabbits. Color photos. 64 pgs. For Dummies, the best-selling book series. Chapters include info on: Bunny basics, is a rabbit right for you?, feeding, housing, grooming, common health problems, training, breeding, saying goodbye, playing, in the house, ten signs that require emergency action, ten great web sites, and an appendix on rabbit resources. B/W illustrations, color photos. 294 pgs. Types available, housing, equipment, feeding, health, grooming, mail-order supplies. Choosing the right rabbit, the H.E.L.P. technique, housing, daily observations, nutrition, management, common health problems, stocking a first-aid kit. 32 pgs. 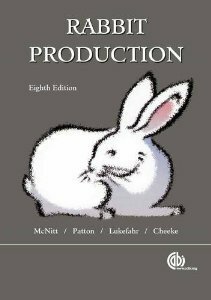 Published by the American Rabbit Breeders Association as a guide for the established breeder & the beginner. You'll find descriptions for ideals in rabbits & cavies. 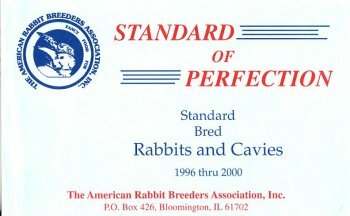 It provides a guide for evaulating rabbits & cavies on the judging table, as well as serving as a guide for the breeding of top quality show animals. These standards are subject to revision every 5 years.Changes are made only when it is found necessary for the good of the breed. Illustrations, B/W photos, color photos. 238 pgs. In legend & literature, choosing, handling, health,b reeding, genetics, economics, odd facts. Color photos. 125 pgs. Hundreds of ideas to ensure your pet's happiness. Housing, litter box, food, healthy chewing, exercise, fun and games, grooming, health care, love and affection. Color photos. 63 pgs. 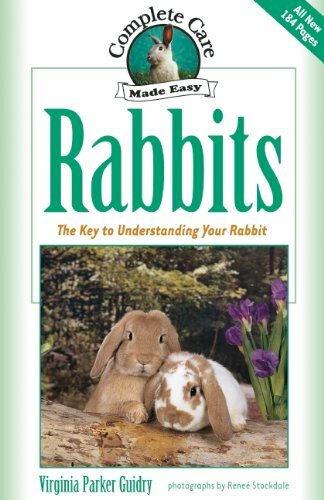 Practical & informative book by a specialist in rabbit behavior. 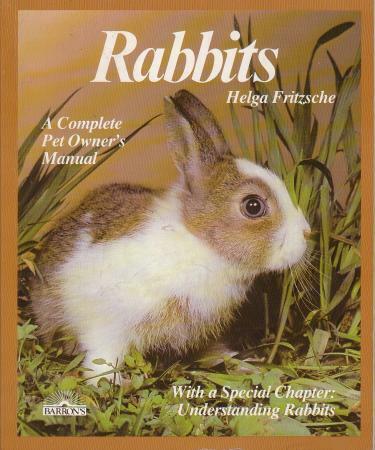 Arranged in an A to Z format, it covers the whole spectrum of rabbit behavior dealing with a whole range of problems. 208 pgs. Great for adults or kids ages 14 & up. Choosing, housing, equipment, feeding, ailments, breeding, grooming, handling. B/W photos & illustrations. 151 pgs.